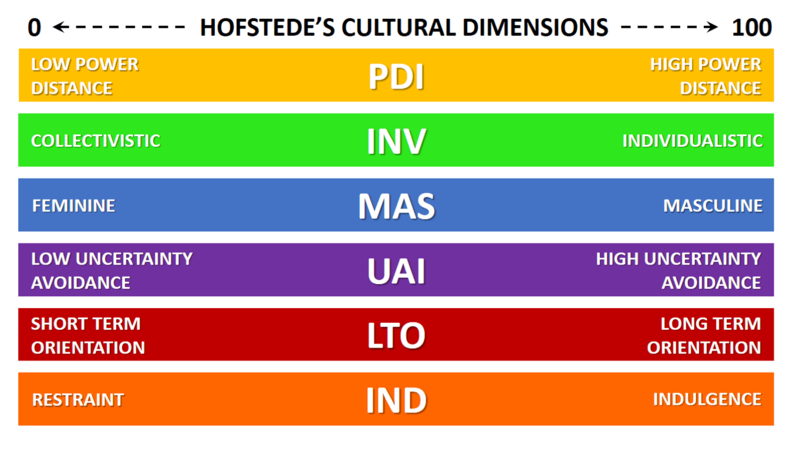 Hofstede’s cultural dimensions theory is a framework for cross-cultural communication, developed by Geert Hofstede. It describes the effects of a society’s culture on the values of its members, and how these values relate to behavior, using a structure derived from factor analysis. Over the years, this study led to six cultural dimensions on which nations can be ranked: Power Distance, Individualism/Collectivism, Masculinity/Femininity, Uncertainty Avoidance, Long-term/Short-term Orientation and Restraint/Indulgence. Source: Hofstede, G. (1984). Culture’s Consequences: International Differences in Work-Related Values. Beverly Hills CA: SAGE Publications. The Porter Diamond is a model that is designed to help understand the competitive advantage nations or groups possess due to certain factors available to them, and to explain how governments can act as catalysts to improve a country’s position in a globally competitive economic environment. Source: Porter, M.E. (1990). The Competitive Advantage of Nations. New York: Free Press. 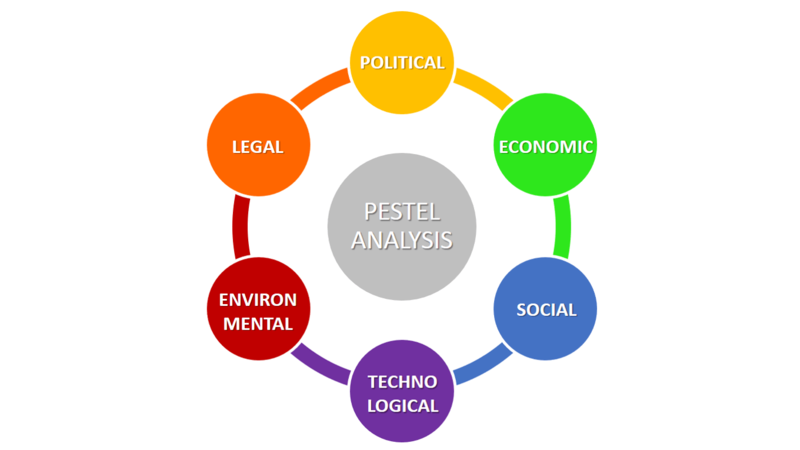 Originated as PEST Analysis, this framework is used in the early phases of strategy development to describe the landscape and environment in which a firm operates (PESTEL stands for Political, Economic, Social, Technological, Environmental and Legal). Note: It is sometimes transformed into SLEPIT (Social, Legal, Economic, Political, Intercultural, Technological), STEEPLE (Social, Technological, Economic, Environmental, Legal, Ethical) and DESTEP (Demographic, Economic, Social, Technological, Environmental, Political). This tool is especially useful when starting a new business or entering a foreign market. It is often used in collaboration with other analytical business tools such as the SWOT analysis and Porter’s Five Forces to give a clear understanding of a situation and related internal and external factors. Porter’s Five Forces analysis is a framework that helps analyzing the level of competition within a certain industry. It is especially useful when starting a new business or when entering a new industry sector. According to this framework, competitiveness does not only come from competitors. Rather, the state of competition in an industry depends on five basic forces: threat of new entrants, bargaining power of suppliers, bargaining power of buyers, threat of substitute products or services, and existing industry rivalry. 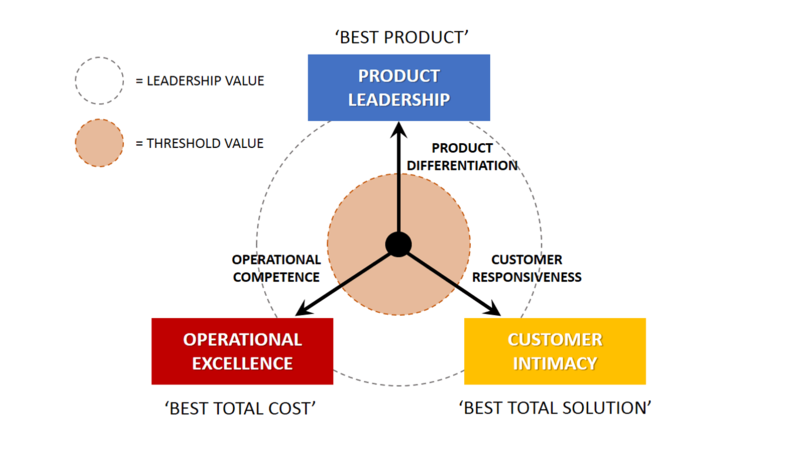 The Value Net Model is an alternative to Porter’s Five Forces and recognizes the importance of competitors’ as well as complementary products in the industry. The model focuses on the four main groups that influence a company’s direct environment: Customers, Complementors, Competitors and Suppliers. 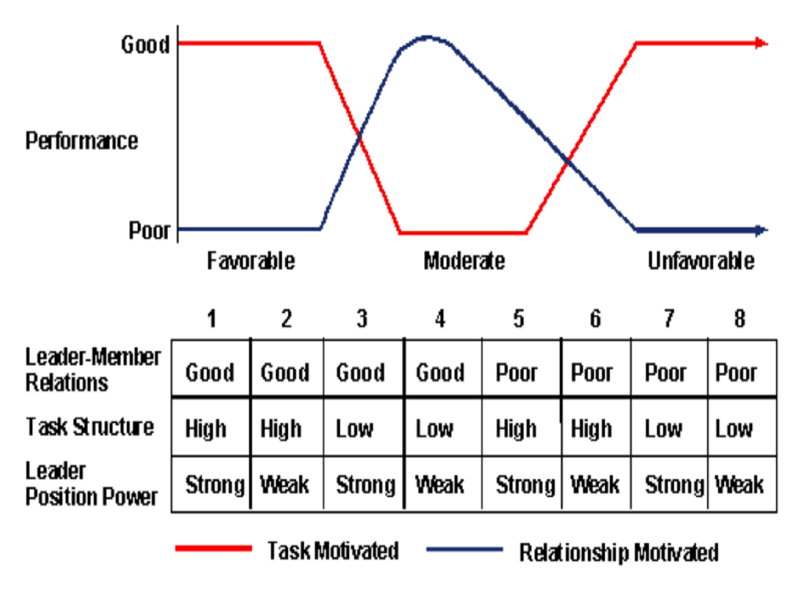 Customers and Suppliers are described in similar terms to Porter’s model. Competitors however entails the Existing Rivals, New Entrants and the Substitutes in this model. The Complementors are a new element to the model. Source: Brandenburger, A.M. & Nalebuff, B.J. (1996). Co-Opetition: A Revolution Mindset that Combines Competition and Cooperation. Crown Business. 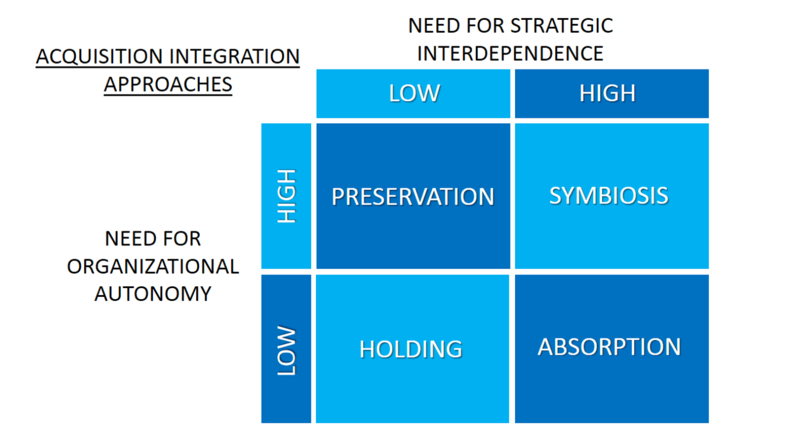 This framework distinguishes four different approaches to Acquisition Integration or Merger Integration depending on a company’s need for Strategic Interdependence between the acquirer and the target firm and the need for Organizational Autonomy: Preservation, Symbiosis, Holding and Absorption. A.T. Kearney proposes four distinct strategic approaches using these two dimensions—predictability and a company’s ability to shape or adapt to its industry. Source: A.T. Kearney (2010). Playing on the New Strategy Chessboard. The BCG matrix (also known as Boston Box) is a framework to help decision making on existing product lines. 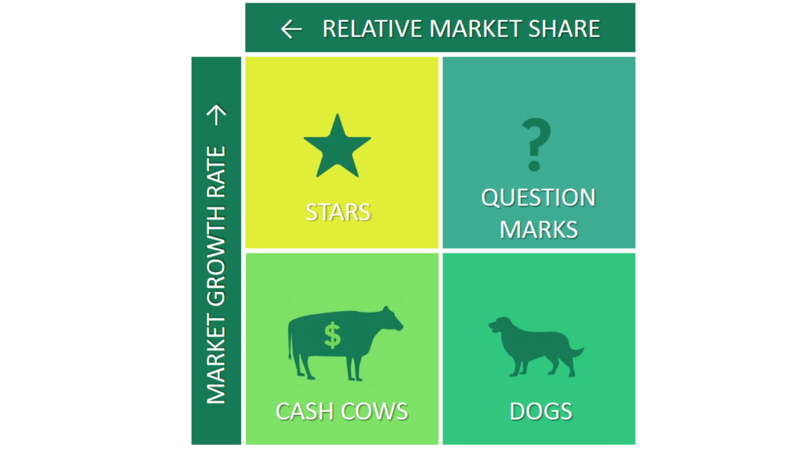 Developed in the 1970s, it has been used to evaluate how a company should think about its portfolio based on two criteria: the relative market share of a product and the market growth rate resulting in four archetypes: the Dogs, Question Marks, Stars and Cash Cows. Source: Henderson, B. (1970). Growth-Share Matrix. BCG Perspectives. The nine-box matrix offers a systematic approach for the decentralized corporation to determine where best to invest its cash. Rather than rely on each business unit’s projections of its future prospects, the company can judge a unit by two factors that will determine whether it’s going to do well in the future: the attractiveness of the relevant industry and the unit’s competitive strength within that industry. Source: McKinsey & Company (2008). 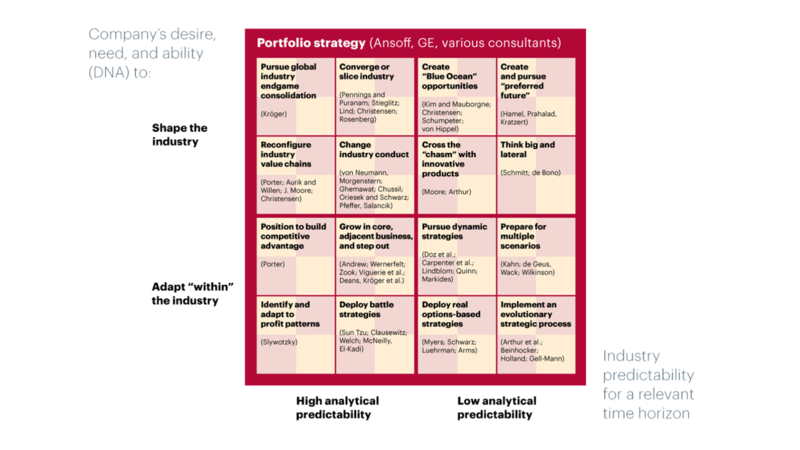 Enduring Ideas: The GE–McKinsey Nine-box Matrix. McKinsey Quarterly. 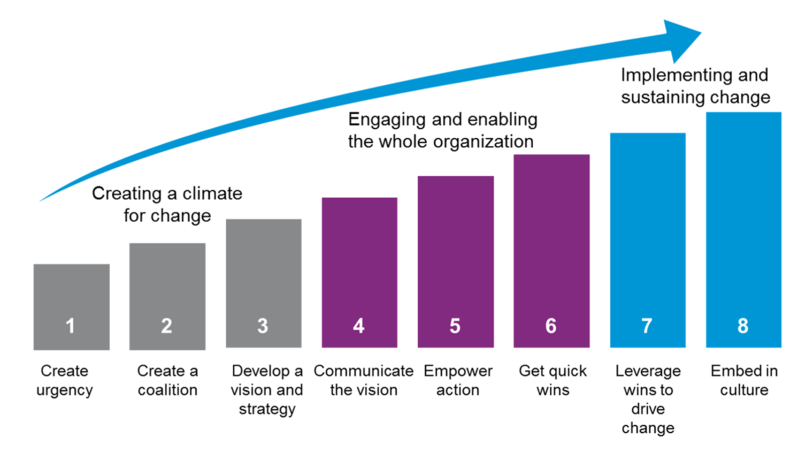 Source: McKinsey & Company (2008). Enduring Ideas: The 7-S Framework. McKinsey Quarterly. The framework (developed by Donald Hambrick and James Frederickson) puts the economic logic at the center of the analysis. 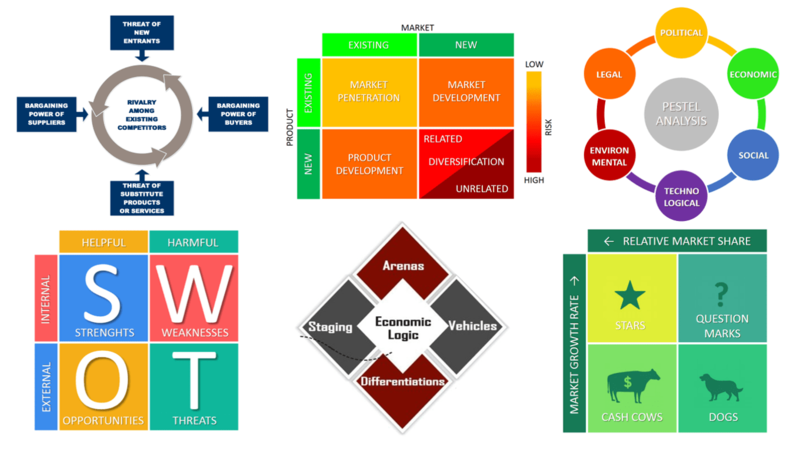 Five dimensions are analyzed: Arenas, Vehicles, Differentiators, Staging and Economic logic. Strategy is about making important choices, and the real power of the Strategy Diamond is that it integrates important choices into a bigger picture instead of as a piecemeal approach. Source: Hambrick & Fredrickson (2005). Are You Sure You Have a Strategy? The Academy of Management Executive. There are different ways of growing a business. Igor Ansoff identified four strategies for growth and summarized them in the so called Ansoff Matrix. 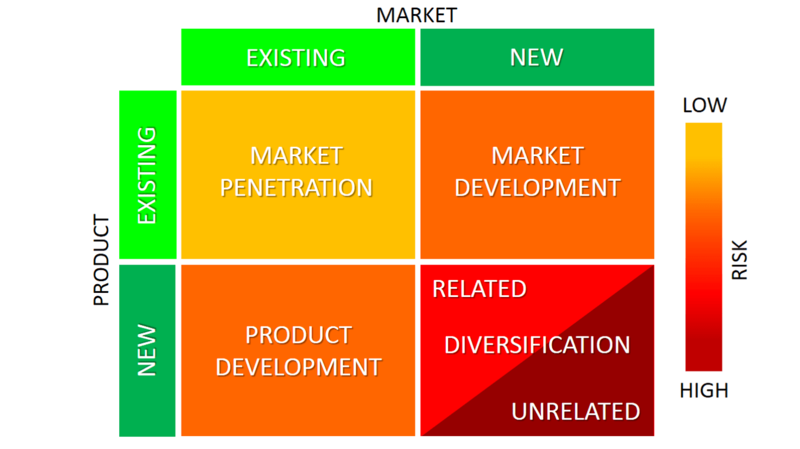 The Ansoff Matrix (also known as the Product/Market Expansion Grid) allows managers to quickly summarize these potential growth strategies and compare them to the risk associated with each one. The idea is that each time you move into a new quadrant (horizontally or vertically), risk increases. Source: Ansoff, I. (1957). Strategies for Diversification. Harvard Business Review. Source: Osterwalder et al. (2004). 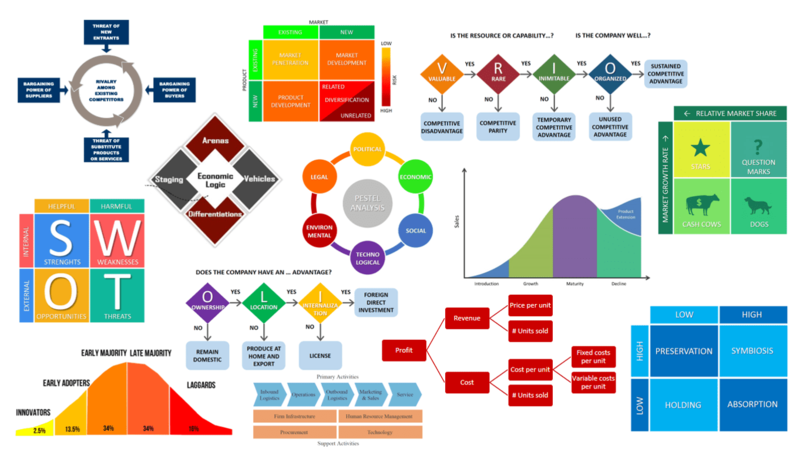 The Business Model Ontology: A proposition in a Design Science Approach. The OLI Paradigm is a tool that helps management choose between several foreign market entry-mode strategies such as exporting, licensing and Foreign Direct Investment (FDI). 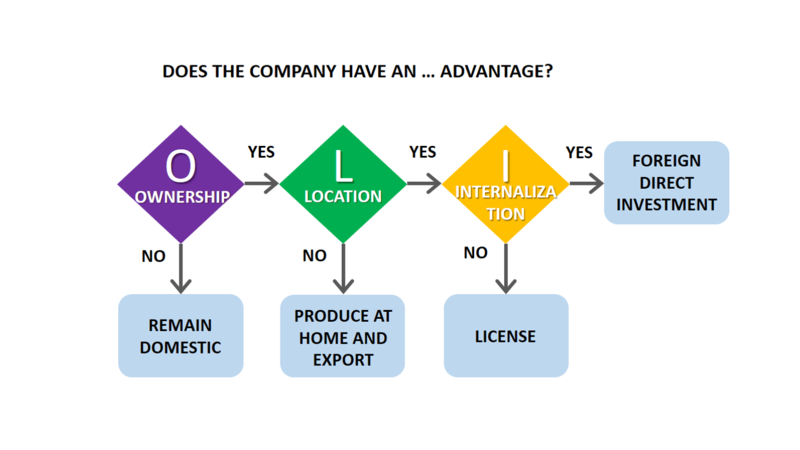 According to this framework, a company needs three advantages in order to be able to successfully engage in FDI: Ownership advantage, Location advantage, Internalization advantage. If any of these advantages is not present, management might want to choose different entry-mode strategies such as exporting or licensing instead. The framework was initially developed by John Dunning in 1979 under the name Eclectic paradigm. Dunning draws upon theories such as the internalization theory and the transaction cost theory to validate his framework. Source: Dunning (1979). Toward an Eclectic Theory of International Production: Some Empirical Tests. Journal of International Business Studies. Porter’s generic strategies describe how a company pursues competitive advantage by positioning itself in between its rivals. 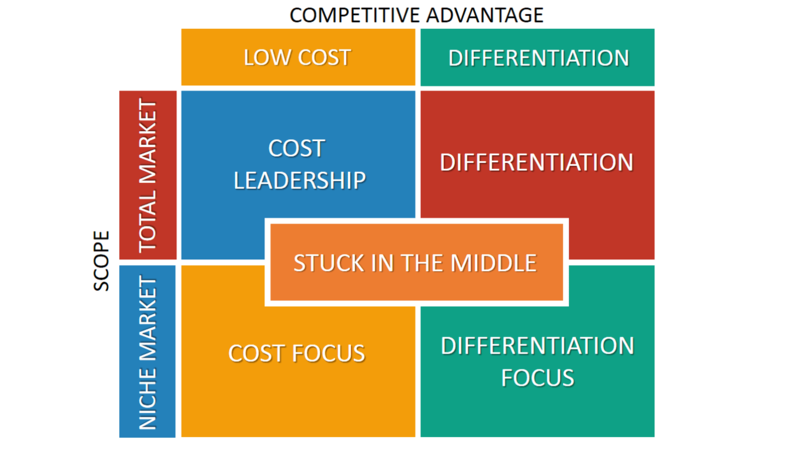 There are three generic strategies for competitive advantage: Cost Leadership, Differentiation and Focus. A company chooses to pursue one of two types of competitive advantage, either via lower costs and thus a lower price or by differentiating itself along dimensions valued by customers to command a higher price. A company also chooses one of two types of scope, either focus (offering its products to selected segments of the market) or industry-wide, offering its product across many market segments. Combined these strategies offer four potential ways of companies to position themselves. Companies that try to excel in all of these ways would end up somewhere ‘stuck in the middle’, according to Porter. Source: Porter, M.E. (1985). Competitive Advantage: Creating and Sustaining Superior Performance. Harvard Business Review. 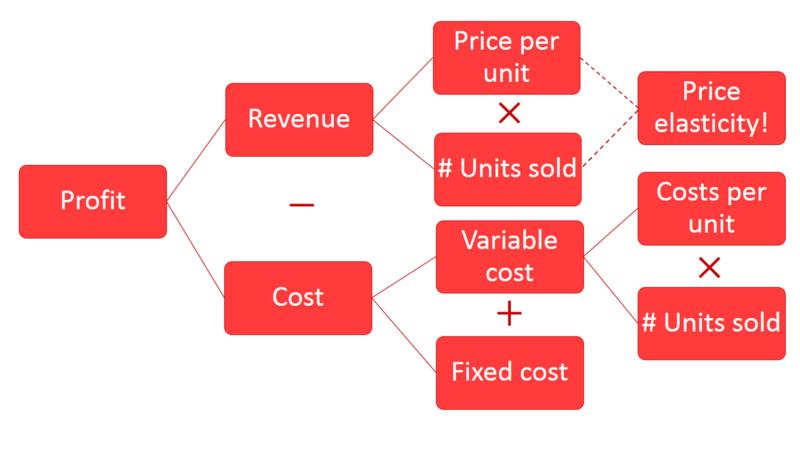 The profit tree is a simple but very effective way to structure a company’s revenue and cost streams. It allows a company to see where improvements can be made in case of profitability issues. 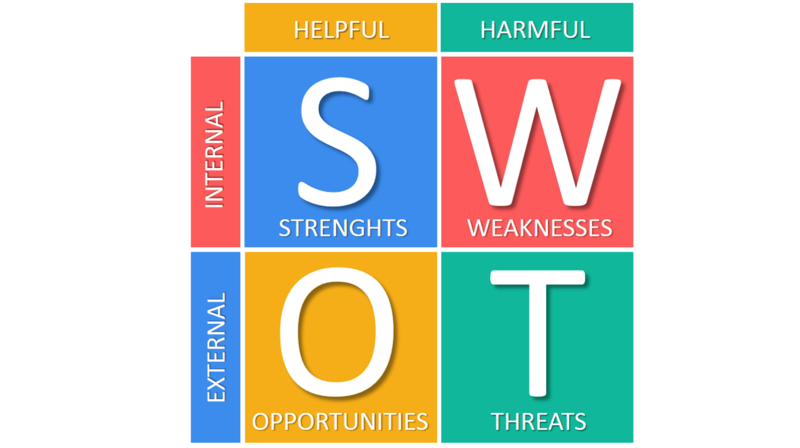 SWOT Analysis (Strenghts, Weaknesses, Opportunities and Threats) is a structured method to analyze both internal and external factors that are likely to affect a company’s success. This framework needs little introduction as it has been used and overused in virtually every strategic planning discussion. It needs to be combined with the TOWS matrix to gain additional insights. Source: Porter (1985). Competitive Advantage: Creating and Sustaining Superior Performance. Simon and Schuster. 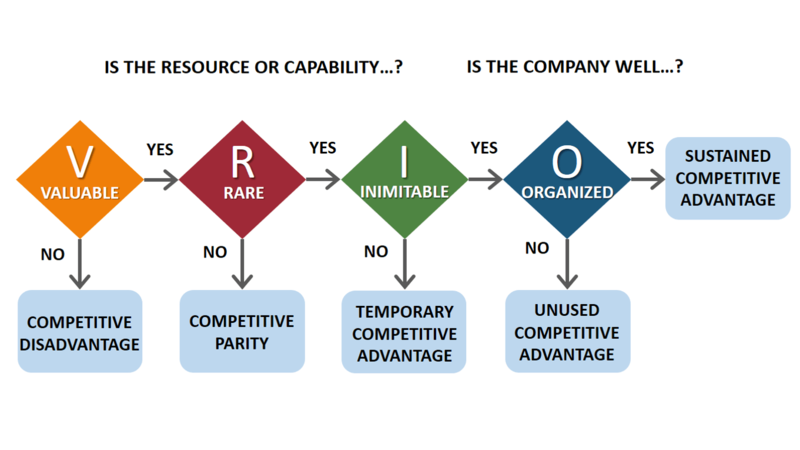 VRIO framework (formerly known as VRIN) is a business analysis tool that helps assessing the internal sources of sustainable competitive advantage and is therefore part of the Resource-Based View (RBV). According to this model, resources and capabilities should have four attributes that lead to sustainable competitive advantage. Resources should be Valuable, Rare, Inimitable and Organisation-wide supported: VRIO. Source: Barney. (1995). Looking Inside for Competitive Advantage. Academy of Management Executive. Source: Levitt (1965). Exploit the Product Life Cycle. Harvard Business Review.